VERY IMPORTANT - PLEASE READ CAREFULLY!!! This mod has been re-loaded and re-saved using the SSE Creation Kit (as I got it working properly without strange behaviours), and the archive was extracted and repacked too. Without SKSE there are furthermore some limitations that will be automatically removed by the mod itself once SKSE will become available for SSE too. - spoilage is not available without SKSE. - without SkyUI (that is SKSE-dependent), you have to deal with the "sugarball" to have access to the configuration menu. So please don't delete it as copyviol. And all common users, please don't report this file again as copyviol since it ISN'T a copyviol. Re-saved (again) since I got SSE working fine. Now it shows version 44. 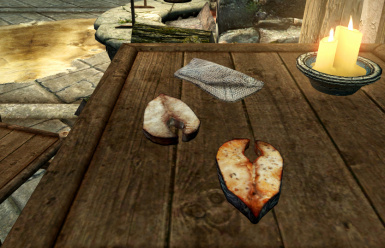 Patch for Beyond Skyrim available here: http://www.nexusmods.com/skyrimspecialedition/mods/10928/? Not a happy bunny about the lack of widgets in this version. Other than that - as good as expected. There is a typo on record RND_DiseaseRattles and RND_DiseaseRattlesTrap: "Rattles is a mild common diseased". And on RND_DiseaseBrainRot and RND_DiseaseBrainRotTrap: "BrainRot is an extremely dangerous common disease". Also at DiseaseRockjoint the mod changes "Rockjoint" to "Rock Joint". This is incorrect. The proper name is rockjoint. 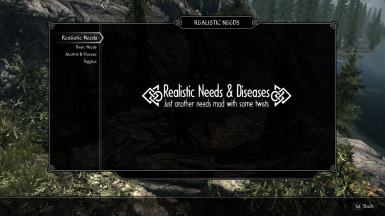 I actually forgot it wasn't part of this mod and I was running around looking for the medicine recipe book for ages! how do I make this work for vampires? is there a mod for that? Female hands become huge after drinking animation. Is it any fix for this or I have to disable animations? you have another mod causing this, look somewhere else. 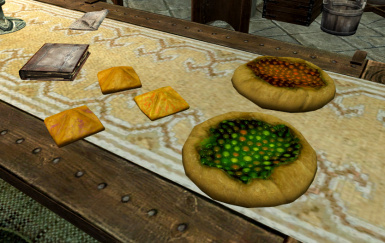 do you know if RND would work with Cooking In Skyrim? I am only able to use my tent once: The first time I crouch activate it deploys normally ( though i guess it does nothing if you dont have a bedroll). I pack it back, and from then on when i drop it again and crouch activate the bag just fades out and no tents appear. I can do "use tent and its blocking me but it is invisible. Had a problem with alcohol not working or changing from skyrim type, no thirst or drunk effects and still had stamina effects showing. One other thing if i just tried to put RND further down the load order LOOT kept moving lightweight potions after it so i had to specify rnd after lp. I love this mod. Just one question. Is there any way to play an animation when drinking from river? My PC only crouchs, but no animation is displayed. Not sure if this is the correct behaviour. Thanks again for this great mod! how can we get other meats like mud crabs to actually fill you up?